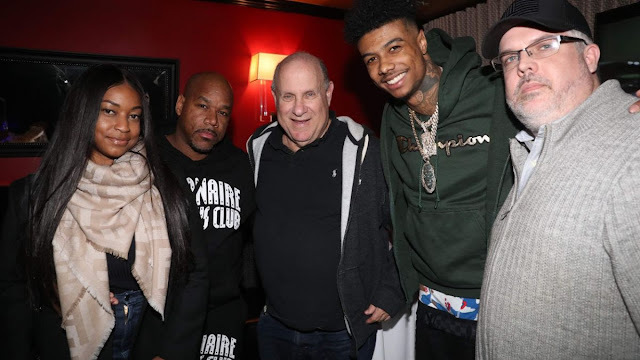 (Left to Right): Kimberly Jones, 5th Amendment Entertainment; Wack “100” Jones, 5th Amendment Entertainment; Alan Grunblatt, eOne’s President, Urban Music; Blueface; Sean Stevenson, eOne’s Executive Vice President and General Manager, Music. Entertainment One (eOne), the label famous for artists like The Game, Royce 5’9”, Ray J, Lil Kim and more, is excited about the success of its newest hitmaker Blueface and his single “Thotiana,” which has climbed the charts in a matter of weeks. Last night, eOne hosted a private cocktail dinner at the famed Philippe by Philippe Chow, celebrating the success of the single and how quickly it has infiltrated radio stations around the country, all digital platforms and its rise up the Billboard Hot 100 Chart (currently sitting at #66). The single was also #1 most added at both Urban Mainstream Charts at radio this week. Named one of the hottest artists to watch in 2019 by outlets like the New York Times and Pitchfork, Blueface has been taking the music industry by storm, receiving co-signs from artists such as Drake, Ice Cube, Kendrick Lamar, G-Eazy, The Game, Lil Baby and more. His single “Thotiana” featured on his Famous Cryp album via 5th Amendment Entertainment/Entertainment One, has garnered over 16.5 million streams on Spotify, over 9 million views on YouTube and has been added to several playlists including Spotify’s “Rap Caviar.” Blueface's style of rapping and unique voice has brought him lots of notoriety as he has been compared to fellow Cali rappers E-40 and Suga Free, as well as Southern rappers Juvenile and Silkk the Shocker. “Thotiana” is currently available on all digital platforms.